Is it possible to over-proof the BF and then under-proof the final proof? If this is possible, how should we expect the crumb to look? This question came to be when Kat, on another post posted her crumb. I think you asked me in the original post whether the dough was 'under-proofed' Dan and this might be a typo in your post above. I then said that this was a very long bulk that resulted in a very proofy and gassy bulk and attach fyi the dough in question in banneton....on the left hand side but only proofed 2 1/2 hour at 4C in wine cooler and dough was 74F when it got in.... So potentially I underproofed the 2nd proof in the wine cooler and should have pushed more? This reminds with on the thread on bulk fermentation with Trevor's and Maurizio's comments. I am intrigued with pushing the dough to it's limit in bulk because it can produce a very light loaf and build structure therefore via gas but it comes with risks.. But the loaf on the right was so light and airy it was almost unreal. The further you push your dough during bulk, the greater potential it has to achieve more total loaf volume (up to a point, of course). The downside is that the proofier the dough, the more delicate it becomes. So it requires greater dough handling skills to shape a proofier dough without degassing it than it does to shape a younger dough without degassing. So if I understood Dan correctly, then the question is, if you have a perfectly but pushed to the limit dough from a long bulk fermentation what will happen to it, if it is underproofed in 2nd proof? Does it need a shorter proof because it has gone so far in the bulk fermentation? I corrected the error in the initial post. Thanks. Your crumb makes me think your bread was under-proofed because of the combination of large and small holes. But you told me that the dough was probably over-proofed during the BF. Since the crumb looked under-proofed (IMO), it make me wonder if a dough could be over fermented during the BF and then be under-proofed during the final proof. If this is possible, that would explain the under-proofed (large hole/small hole crumb). but it is interesting how to define 'over fermented' in BF...it all depends on what type of loaf you wish and what method to use but when I revisited the bulk fermentation post where I summarised a post from Trevor where he compared his two loaves that if a loaf it pushed in bulk in the 50% region then you can get a rise that is better where another loaf might overproof trying to achieve that in 2nd proof. If my thinking is correct, I define a dough that has been over fermented during BF as one that has exhausted much of the gas and is unable to increase rising. If this dough was sliced the alveoli would be small with no large bubles, exactly like an over-proofed baked crumb would look. My original question was born when I ask if the dough was under-proofed. 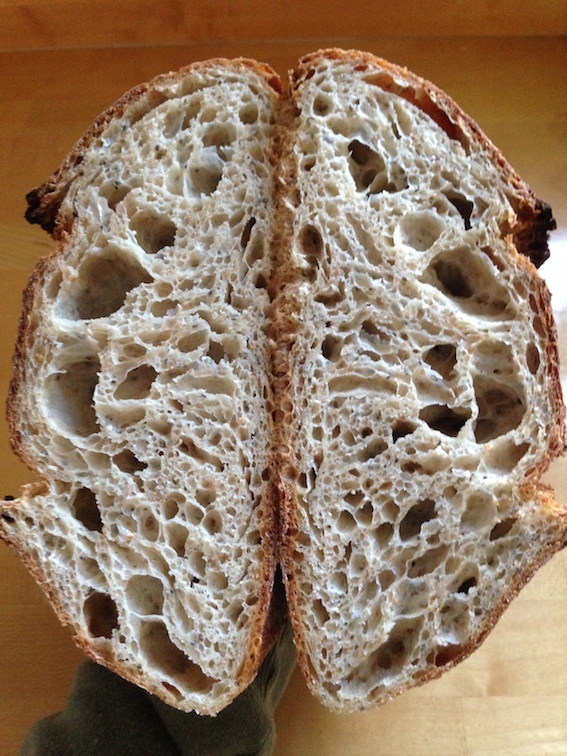 I asked because I noticed the crumb shot contained both large and also more dense alveoli in the original bread. Kat replied saying that the dough actually over-proofed during the BF. Thus the question, is it possible to over-proof a BF and then under-proof the final proof? 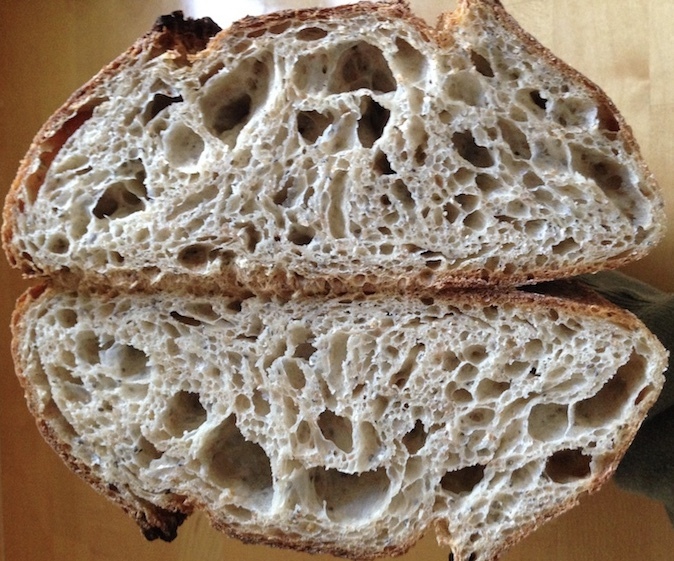 Here is the crumb shot in question.